“You are not washing enough. If you just washed your face more then you wouldn’t have this acne.” While washing your face twice a day can improve acne by removing bacteria, not washing the face is not the sole cause of the acne. Washing may improve mild acne, but even washing the face twice a day with an acne wash it still may not clear some acne if other topicals or even oral drugs are needed depending on the severity. Acne improves the more you exfoliate with a scrub. Actually moderate to severe acne can worsen because of inflammation and redness caused by too much scrubbing. You can use a chemical exfoliator such as those containing glycolic and salicylic acid such as Flawless Pro Clear Pads. Acne ends when you are teenager. Acne can start any time in life. Some even get their first case of acne as an adult. 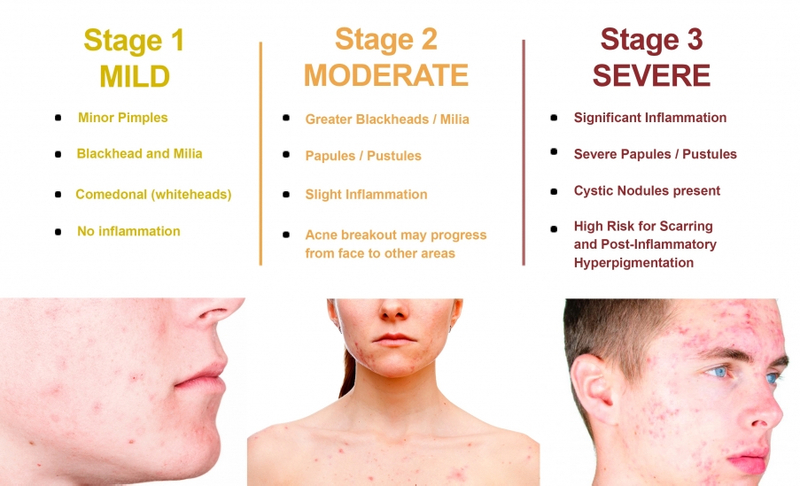 Some keep their acne from teenage years into adulthood. I should wait to take my child in until the acne is worse because it’s not really serious enough to take him/her in now. I see patients that have early or even late scarring because they waited. This is preventable. Scars are not completely cleared even with lasers and fillers and so much easier to prevent instead of treat. Diet plays a large part of acne. Some studies have shown high glycemic foods or dairy can cause acne but this is not a major contributor. Eat a healthy diet and avoid foods you know worsens your acne. Accutane ( isotretinoin) should be avoided except in the worst cases of acne because of all the severe side effects. Accutane is a derivative of Vitamin A which is actually more natural than taking antibiotics, especially long term antibiotics that can lead to resistance of these drugs, causing them not to work. Even though mood disorders, depression, and suicidal thoughts have been reported in patients taking isotretinoin, it has not been proven that isotretinoin causes these problems. Many studies show improvement of acne with Accutane also improved depression and anxiety and quality of life. Acne is not serious enough to go to the doctor. 50 million people in the US have acne and can have a negative psychological, cause permanent scarring, poor self-image, depression and anxiety. Acne and acne scars decrease confidence. Almost 50 percent of adults still have not outgrown the acne they had when younger and a large percentage of these with acne avoid social gatherings because of pimples and acne scars. 60% would wear less make up. I can make an appointment two weeks before an important event to clear my acne. Acne treatments take at least 2 months to see if they are working. Then if satisfactory results are obtained, the treatment regimen is changed or treatments are added. Acne is an inflammatory process and takes time to improve. Use a gel cleanser and wash twice a day and after sweating but no more. Some over the counter products have salicylic acid or benzoyl peroxide. Flawless Pro Clear wash at Gaughf Dermatology also contains Benzoyl peroxide. Wash your hair regularly as the oils from the scalp can mix with hair products and travel down the face. Also shield the face if you use spray hair products on the face. Keep your hands away from your face including sleeping or leaning on the face. Use all non – comedogenic or oil free cosmetics and sunscreen.